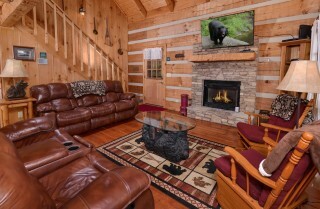 Tucked among the trees of the Great Smoky Mountains, your cabin stay can be as connected or disconnected from the hustle and bustle of the city as you like. 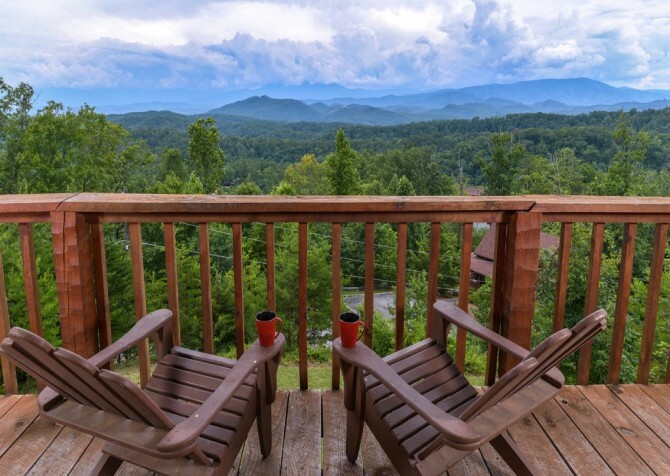 What guests of Hard to Leave will really not want to pry their eyes from are the breathtaking views of the Smoky Mountains directly through the windows and from the deck chairs. Soak in the picturesque waves of green forests or kaleidoscope of warm colors of the fall. 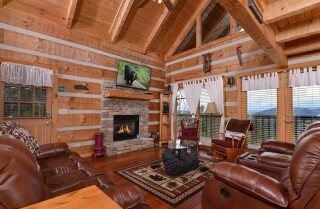 This mountain cabin with rustic decor will lend you the escape to nature you needed, while providing all the amenities you want. From a full kitchen, Wi-Fi connectivity, and a big flatscreen TV to a jetted tub, game tables, and an outdoor hot tub, it has the amenities and conveniences to make any stay comfortable, fun, and memorable. 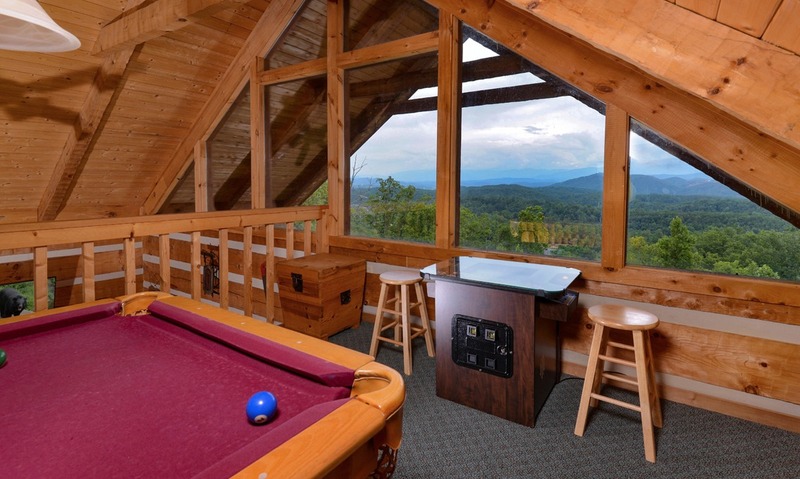 Run away to the Smoky Mountains and stay at Hard to Leave for a cabin vacation to remember! Gather around the playful bear coffee table for board games in the coziness of Hard to Leave’s spacious living room. 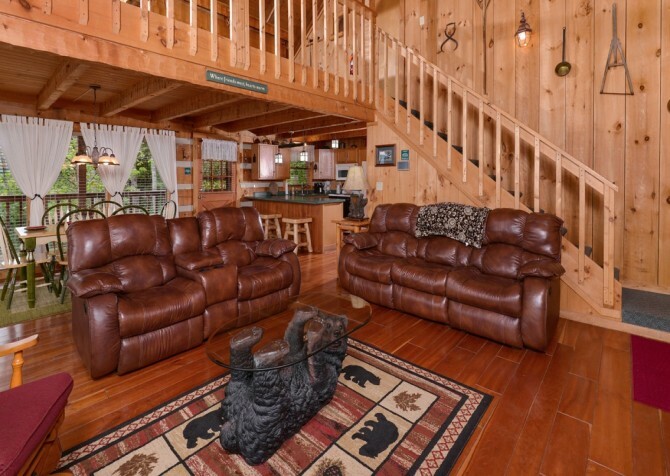 The 2 cushy sofas offer reclining for putting your feet up and relaxing after a full day of shopping in the outlets of Pigeon Forge and The Island. The area makes for a very accommodating movie-night screening on the large flatscreen mounted above the stone fireplace, so bring along some of your favorite DVDs to pop into the DVD player here. 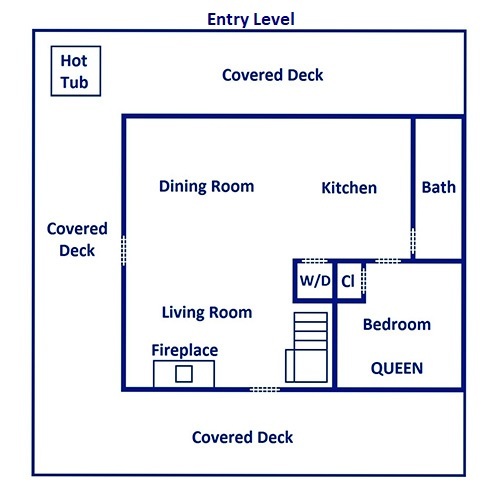 Make some hot chocolate and gather around the fire to share laughs and make plans for the next day. 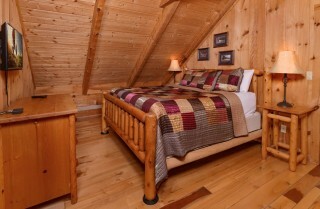 Slowly sway your little one to sleep in the glider as you read their favorite book under the lamplight. 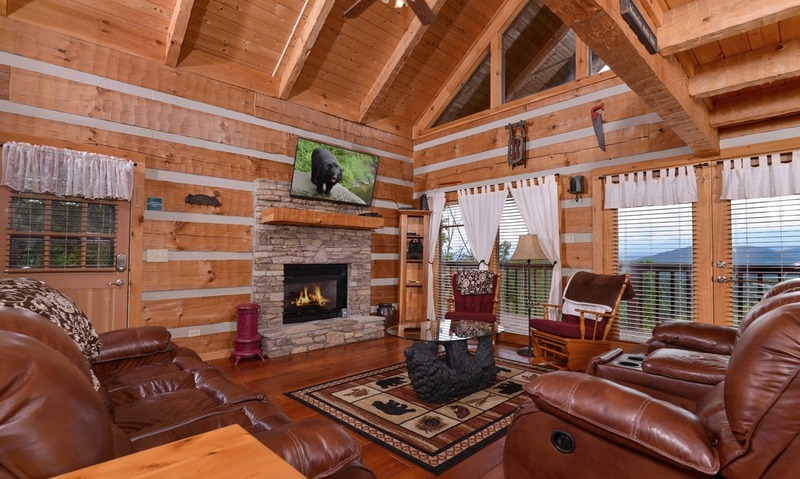 The warm wooden features, mountain décor, and windows framing mountain views will make the living room a perfect place to convene and plan your next outings to the Great Smoky Mountains National Park. 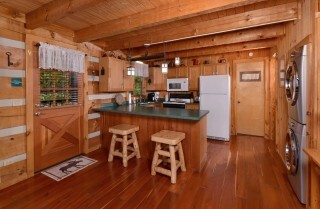 The lovely, inviting mountain kitchen makes cooking those familiar homemade meals you have always loved fun in the cabin. 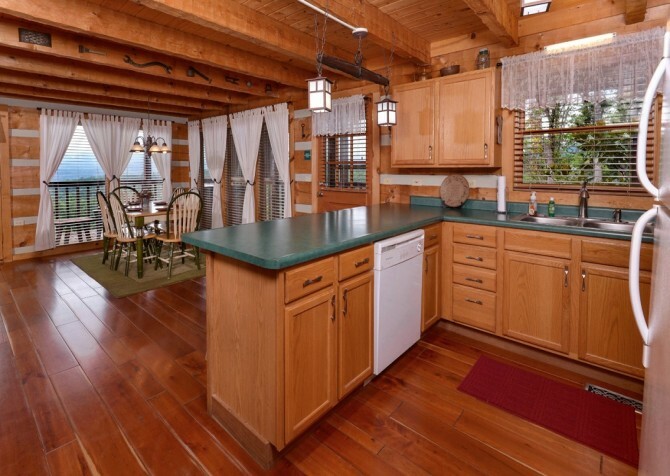 Prepare a hearty Southern meal with favorites like mashed potatoes, sautéed vegetables, and mac n’ cheese, and set them out across the spacious counter for guests to come back for second helpings. You will find plenty of kitchen tools, from pots and pans and dishes to full-size appliances and utensils for preparing and serving a filling meal after a day of hiking Cades Cove or venturing the trail to the 80-foot waterfall of Laurel Falls. 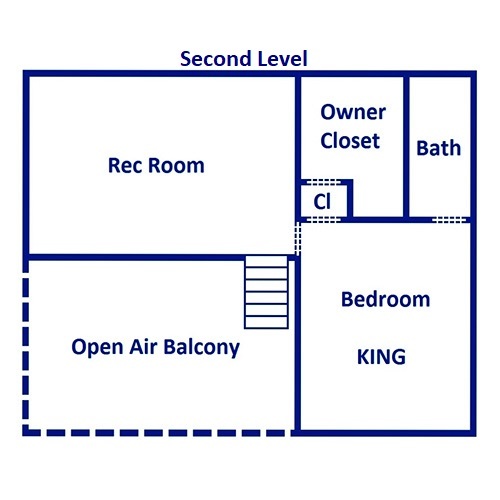 Easily store leftovers in the fridge from a restaurant downtown, or just order pizza and have space to set up a buffet in the kitche. Need your morning pick-me-up? Brew a pot in the coffeemaker or take advantage of individual options with the Keurig coffeemaker. Gather around the large 6-chair dining room table for bonding time over delicious food and hearty laughs. Enjoy all the natural light from the surrounding windows at lunch or feast under the light of the chandelier at dinner. The dreamy, sheer white curtains, warm hardwood floors, and mountain style décor and furnishings will make you feel right at home in the Smokies. Memories around the dining room table are a guest favorite, so don’t forget to bring the family’s favorite board game or a new card game to share with friends! The loft of Hard to Leave is lit by sizable windows facing an alluring Smoky Mountain skyline. 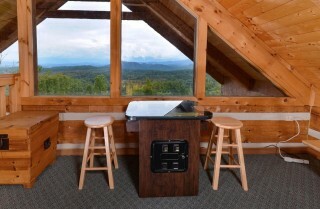 Have a rousing, competitive game of pool or feel a little nostalgic (and show the kids your skills) with the arcade game here. 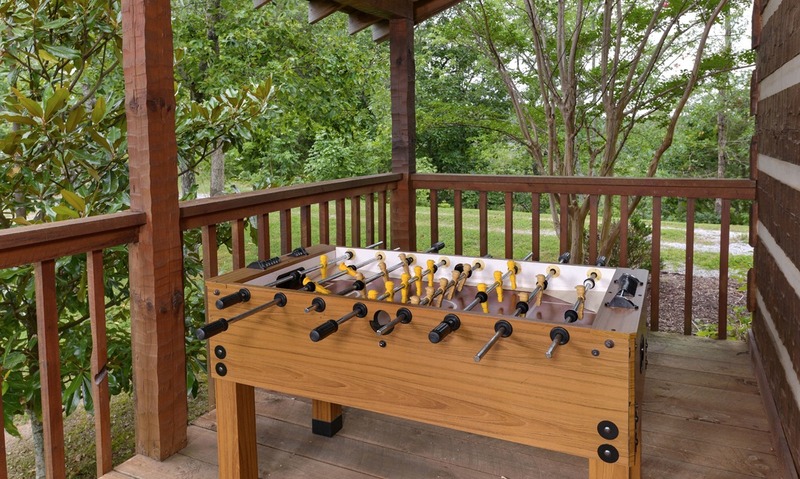 With so many choices – foosball (on the deck), pool, arcade games, playing board games, and watching movies – you won’t have to worry about entertaining everyone or spending too much money during your cabin vacation! 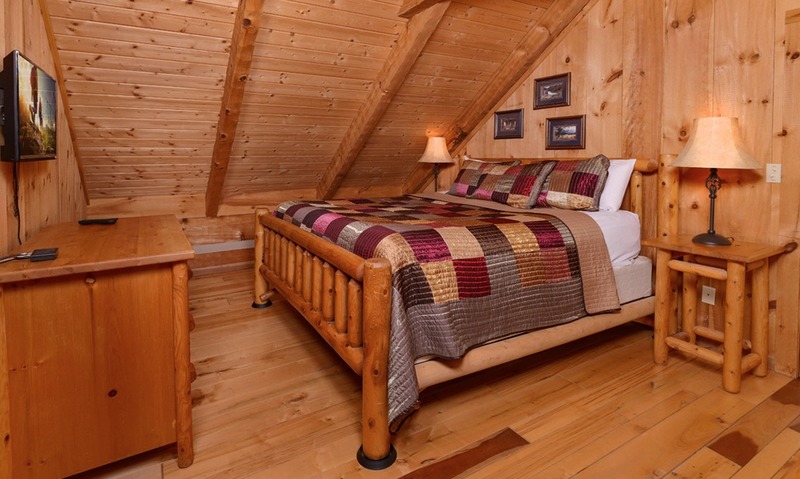 Hard to Leave provides 2 private bedrooms with a queen-size bed in one and a king-size bed in the other, giving 4 guests plenty of comfortable sleeping space. 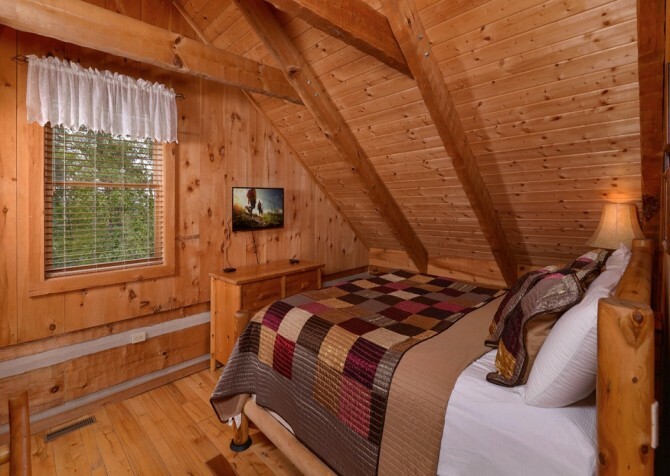 The spacious bedrooms provide all the same amenities of comfy linens, nightstands, reading lamps, flatscreen TVs, and dressers. 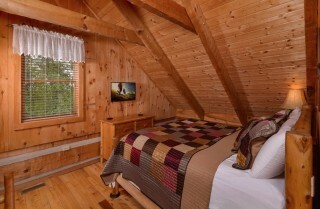 Unwind and take a quiet nap in the room or get some alone time with your favorite audio book. Enjoy the privacy of your own bathroom for each bedroom, and shower off after a full day of theme park rides in Dollywood before taking that nap. Return to your rooms after a fun-filled night in Pigeon Forge and riding the Alpine Mountain Coaster for a much-needed full night’s rest in your homey cabin bedroom. 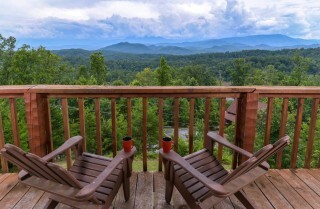 Grab your tea and head to the porch to enjoy your cold drink while sitting in an Adirondack chair overlooking the gorgeous Smoky Mountain skyline. 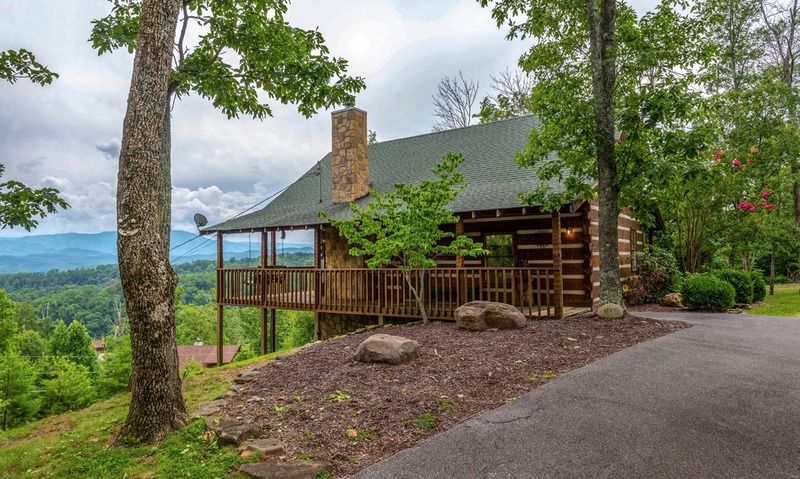 Visit the Smokies during the fall for a natural show of the changing leaves crawling across the mountainsides. 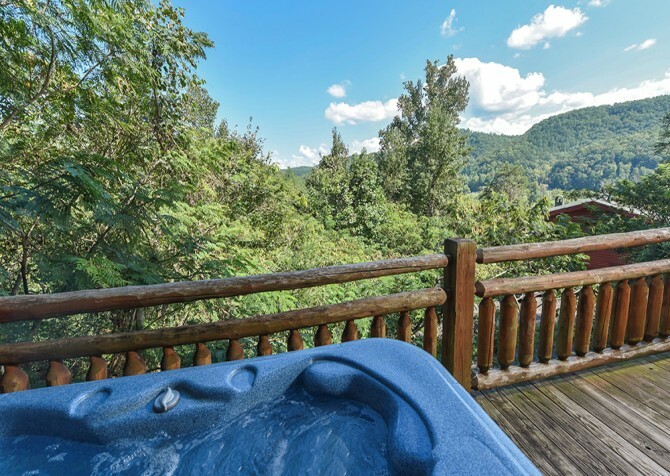 Hard to Leave provides premium seating on the deck for nature’s stunning transition from summer to winter. 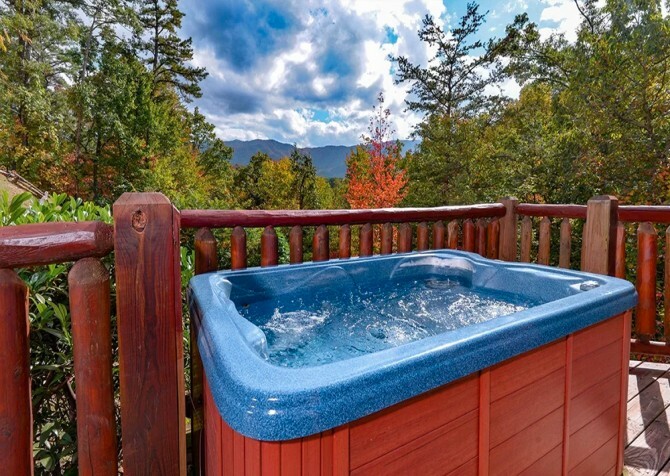 Enjoy the serenity of the mountain air from the hot tub, and let the water soothe your muscles and mind. Want the kids to play outside more? 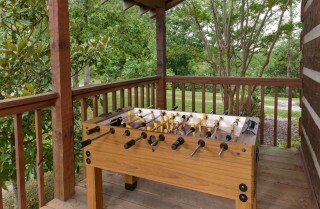 That is an even easier task when there’s a foosball table on the porch! Add a little smoky flavor to those steaks and burgers by grilling out on the charcoal grill while the other chef prepares all the tasty sides in the kitchen. 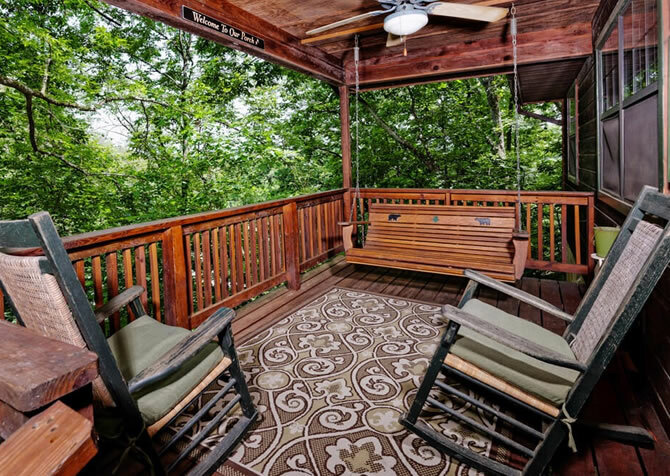 Whether it’s reading a book on the porch swing, loosening up in the hot tub, or goofing off over a game of foosball, the outdoor spaces and the views will definitely be some of your favorite perks at Hard to Leave. And be sure to take note of the hilly drive up with breathtaking mountain scenes along the way! While Hard to Leave is hard to leave, you will love the variety of attractions Pigeon Forge, Sevierville, and Gatlinburg have to offer! 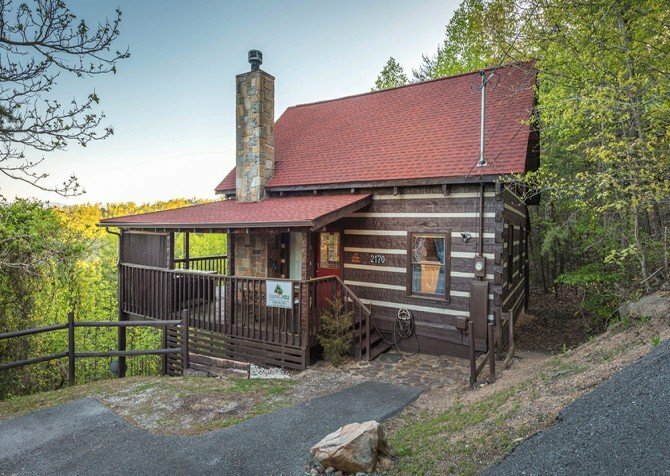 From horseback riding and mountain coasters to museums and tons of shopping, there is something for everyone to enjoy. 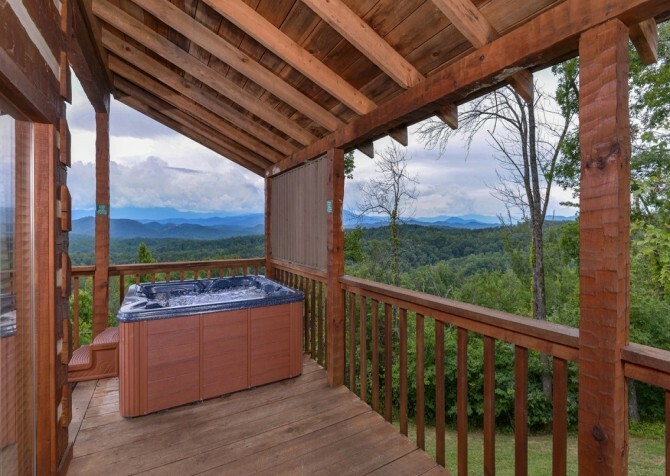 Explore one of the Great Smoky Mountains National Park’s most popular areas tucked into the mountains. Cades Cove has an 11-mile one-way paved loop around a scenic mountain valley filled with tons of wildlife, picture-perfect views, and historical structures preserved by the Smoky Mountain National Park. Take a roller coaster ride unique to the mountain landscape on the Alpine Mountain Coaster! Zip through trees and down rocky drop-offs in your single-car coaster ride. Get your thrill during the day or at night when the track is lit-up with rainbow neon lights. 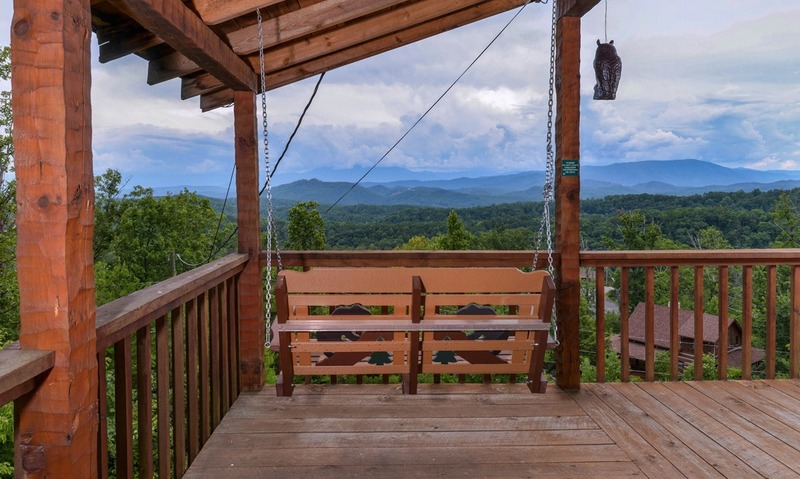 Visit all your favorite name-brand stores at the Tanger Outlets or play at Foxfire Mountain Adventure Park, which offers a ton of ways to enjoy the great outdoors, including the longest swinging bridge in America suspended over Foxfire Gorge! 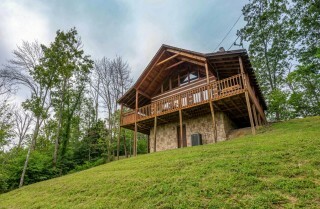 Sevierville also boasts lots of restaurants, unique shops, and family-friendly fun! 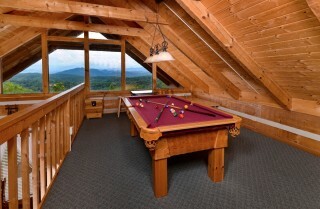 "Excellent accommodations, fantastic views, very private, peace & quiet, but plenty to do and see, for the whole family. 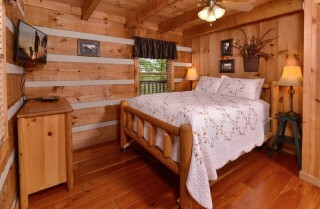 Would highly recommend cabins for you." "Such a beautiful peaceful cabin. Fully loaded with stuff to do for people of all ages! A beautiful mountain view. Nothing better than sitting in the hot tub looking at the mountains! Very close to town but private enough to feel secluded. 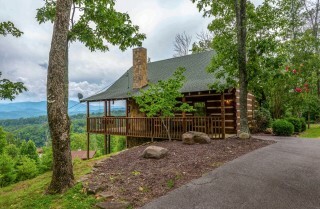 We loved it and will definitely be coming back to this cabin! 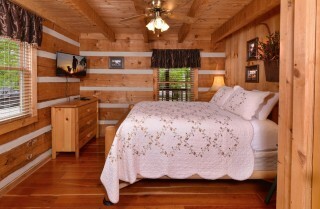 Thank you Cabins for you!" Thank you so much for the amazing review! We are so happy to hear you enjoyed your trip with us and are looking forward to your next trip! Thank you for your review! 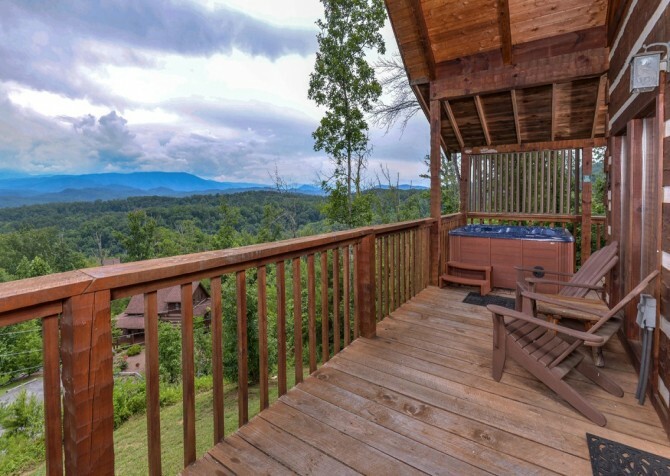 We couldn't be happier to hear how much you enjoyed your relaxing stay at Hard to Leave! 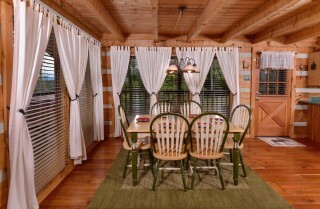 We hope to serve you with even more fantastic cabin stays in the future. 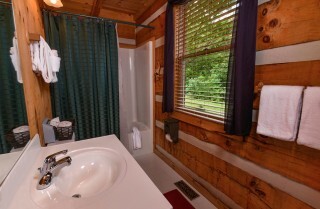 "We stayed in Cabins for You's "Hard to Leave" cabin and the name fit it perfectly. It was more of a home away from home than a cabin. Everything you need and more. The view was stunning, the amenities unbelievable and as for comfort, the best way I can describe it is, again, a home away from home. The cabin was impeccably clean with all the supplies you need to feel at home. We will definitely be staying with them again!" "We stayed at "Hard To Leave". This was our fourth time staying with Cabins For You and we were not disappointed. 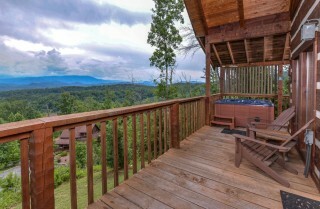 The views were amazing and it was a quiet area, just what we needed. The cabin had everything we needed for our five night stay. The staff helping me plan the vacation were top notch. I recommend CFY to everyone."